I began designing for Closet Factory back in 2004 and enjoy working towards the important balance of creating storage systems that are both beautiful and functional. Originally from Oklahoma City, I left the tornadoes behind and came to Phoenix in 1995 and have spent over 20 years in corporate sales and designing collateral materials for marketing management roles. I do my best to “think outside the box” and get creative so that together, my clients and I can form the perfect design for them. And since I love what I do, it makes my job both enjoyable and rewarding! Contrasting backing can give depth to a space and help tie in a color that will give the continuity of existing materials with the new project. 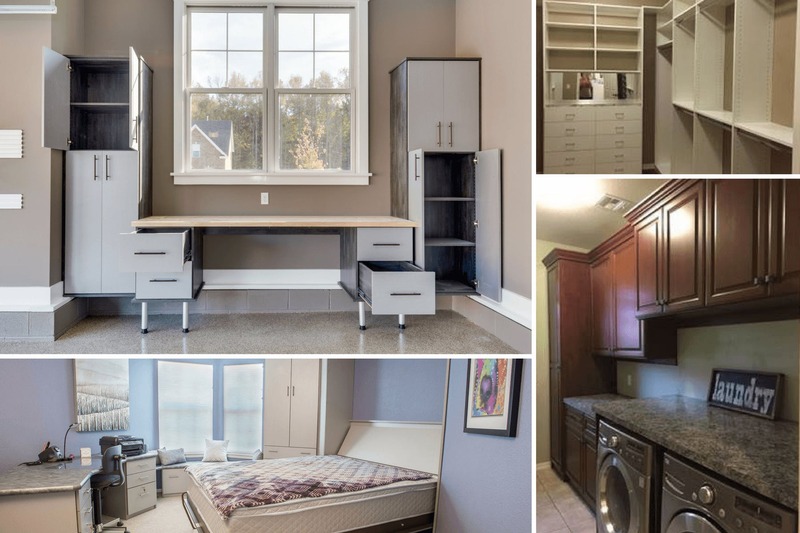 Shallow depth cabinets built on the end of a structure can create the additional storage needed for smaller items when storage is limited with out stealing much space away. 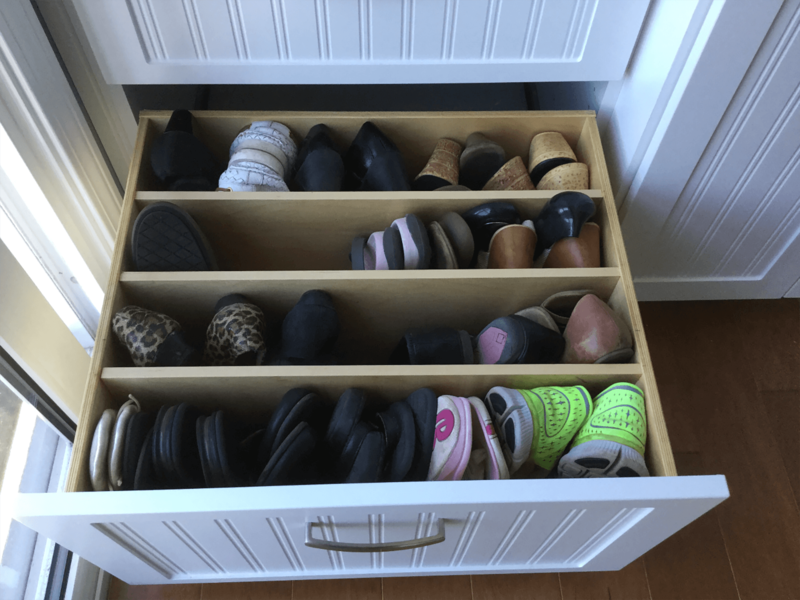 Pull out trays, drawers or baskets are fantastic for storing all those flip flops and sandals. When you stand the shoes up right in the drawer, they are much easier to see and locate instead of flat shoes being stacked on each other on the shelves. I see how they currently live in the space. Are there shoes piled on the floor? Do they have folded clothes squeezed in between the top and lower hanging rods? Is there a hamper in the middle of the closet? Does the current system go as tall as ours can? 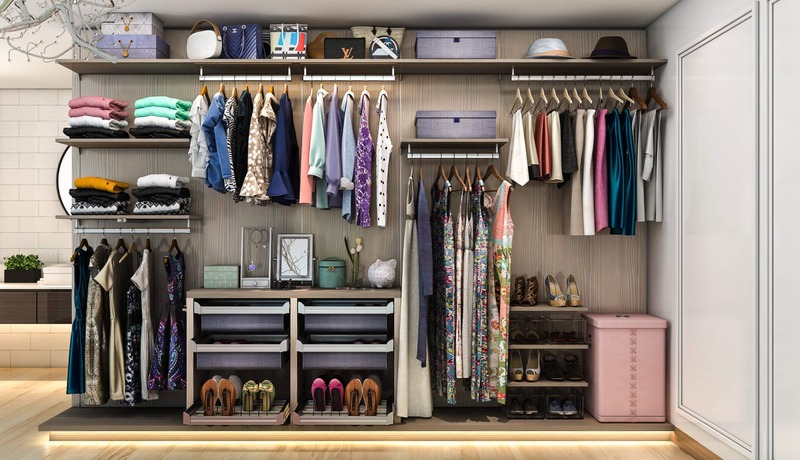 Ask if there are additional clothes in other closets? Asking what their biggest frustrations are as well as pointing out wasted space to them as I look around helps begin their engagement of the design process. I had a secondary garage that had very little storage options for the homeowner. It was detached from the home and was designed to accommodate 2 additional cars and a 40 ft home on wheels. There were so many tools and recreational equipment that the vehicles were not able to be parked in the garage. It took me several hours to measure every item he owned and create an inventory so that I could organize them in a manner that flowed from one wall to the next. When I presented the design, I made sure I tagged the items for their new home. It was exactly what he was hoping someone would take the time and do. When completed, he had so much more space than he anticipated so the 2 car area became a man-cave and a year later, I added a floating bar. Involving the clients through out the process is key because you learn what is truly important to them and what they are trying to accomplish most with this new project. That knowledge is where you will create your value and then build upon it with each aspect of the design. As you discuss the current design, mention options as you look around that can satisfy this problem…and read their responses. Ask open ended questions to bring them into the creative process with you. I always make mental notes as I walk through a client’s home of the details in their cabinetry, architectural design of the home, as well as the pieces of furniture and art the client has chosen to see if there is a connection. A lot of times, finishes they have chosen with me will reflect the same style. However, it’s important to always keep an open mind and ask questions, never assume things. ….people’s interest change through the years and my project could be the beginning of the new style in their home they plan to change to. Floating shelves can create the option for storage with out overpowering a space. Creates a cleaner more open feel and makes its own statement before the showcase items have even been added.